That's Germanodactylus on top, Darwinopterus on the bottom. These are not to scale, although both genera were fairly small pterosaurs. I notice many similarities, especially in the snout. Both have roughly the same number of teeth, both have similar separations between the premaxilla and maxilla. The bony portions of the crest begins just cranially to the nasoantorbita fenestrae in both, and runs up to the back of the orbit. The structure of the mandible in both genera is strikingly similar. Of course, differences remain: in Germanodactylus, the nasoantorbital fenestrae are invaded by two distinct prongs of bone (unless that's an artifact of preservation). The shape of the orbit is very different in both animals, as is the basic architecture of the back of the skull. Wow! That's Pterorhynchus, believe it or not. It was re-prepared by the Chinese after Czerkas & Ji were done with it, I guess. Looks incredible, no? Although it's still really beat up, some features immediately stand out. Most notably, the dentition is a lot closer to Rhamphorhynchus than pterodactyloids. However, most interestingly, it appears to have a singular nasoantorbital fenestra. The dentary is oddly shaped, its ventral margin sloping downward from the joint and then suddenly straightening out, leaving a very obvious "corner" about halfway down. I'm going to say that Pterorhynchus is not synonymous with Darwinopterus, but I think it should be re-described (not by Czerkas) and thrown into a phylogeny, as I'd like to see where it falls out. Anyway, note the impressive soft-tissue crest that is preserved as an impression in the rock. It has its humble beginnings as a small raised bump just in front of the nasoantorbital fenestrae. This has at least some consequence to the crest of Darwinopterus. 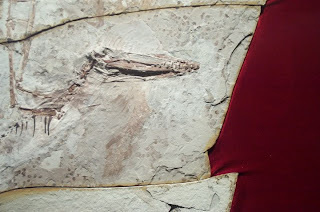 I asked Dr. Unwin, at SVP, whether the new pterosaur's crest was bone or soft-tissue. He said that as the animals grows, the dorsal margin of the crest becomes jagged, which he takes to mean that it began supporting a large soft-tissue structure. This would be awesome, though I'd like to see more specimens. There are apparantly more than 20, though only two are featured in the description. So there you have it. I don't think that Pterorhynchus = Darwinopterus based on a purely superficial look at a low-res photo of the re-prepared fossil of the former, and I think the skull of Darwinopterus looks a lot like the skull of Germanodactylus! SCIENCE! You know that's really interesting. I wonder if when other basal pterodactyloids of either various groups or the clade as a whole turn up they might have the same kind of skull. Germanodactylus has been floating around the bottom of pterodactyloid taxonomy, with some authors considering it closer to Pterodactylus and such. The most recent study by Unwin suggests it was a basal dsungaripteroid, which if true would either mean convergent evolution (perhaps meaning that aerial predatory, if it is the kind of lifestyle that Darwinopterus pursued, evolved more than once in pterosaurs) or else most basal pterodactyloids had a similar skull. I find myself laughing at Czerkas assessment too, I went to his museum in southeastern Utah over the summer and it was horrid! His museum was stating BAND rhetoric everywhere, going so far as to say that maniraptorans and pterosaurs were sister groups, and that the clade of maniraptorans+pterosaurs was the sister group to dinosauria as a whole. Wait, what? (And yes, his Pterorhyncus was on display). 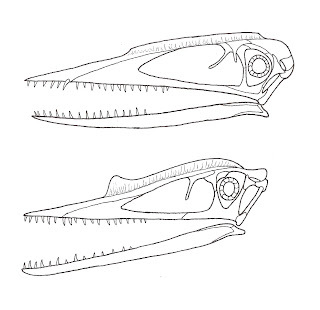 Superficially the skulls of Germanodactylus and Darwinopterus do resemble each other, but I did noticed that the shape of the rostrum is different: in Germanodactylus it seems quite more robust and straight from the end of the nasoanteorbital frenestra onwards, while in Darwinopterus it sort of resembles the condition in Quetzalcotalus, with a curve more or less towards the end of the nasoanteorbital frenestra and thus having a less deep rostrum. The jaw of Darwinopterus also seems to remain more constant in shape, whereas Germanodactylus' is thinner at the tip. You were absolutely right, Zach. Pterorhynchus was basal to Kunpengopterus, Darwinopterus and Wukongopterus. I had it wrong earlier trying to nest the wukongopterids with Elanodactylus within Germanodactylus. The differences in the premaxilla and its teeth got me thinking about this subject again.